Church names left to right: Immaculate Conceptin, Cordal. Our Lady of Lourdes, Scartaglen and Saints Stephen and John, Castleisland. Castleisland Parish Magazine 2018 now available in Churches. Opening our Hearts A Lenten Journey for families leaflet available in all churches. Lenten Programme 2019 leaflet in all churches and on notice board. Lenten Talk for Castleisland Pastoral Area entitled “Resting the Mind and Renewing the Heart” by Martina Lehane Sheehan in the River Island Hotel, Castleisland on Thursday 14th March from 7.30pm to 9.00pm. Castleisland Church: Saturday 4th May at 11.00am. Cordal Church: Saturday 11th May at 11.00am. Scartaglen Church: Saturday 18th May at 11.00am. May the peace of the Risen Christ be with you! 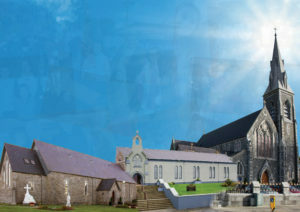 Castleisland Parish Church Mass on line: Parish Masses on Weekdays and Weekends are now available on line. If you have access to the internet just log onto: www.churchservices.tv Click on Churches and type Castleisland. Email castleisland@dioceseofkerry.ie For inquiries re baptisms, weddings, booked Masses and much more please feel free to call in or contact us by telephone. Baptism: Congratulations on the birth of your child. Baptisms in the Parish take place in Castleisland Parish Church after the 11.30am Mass on Sunday, In Cordal Church after the 9.30am on Sunday and in Scartaglen Church after the 10.30am Mass on Sunday. An application form can be downloaded from this site (see below). Please complete the application form, together with your childs birth certificate. The application form can be handed into the parish office during office hours. Occasionally we get a request as to what are the requirements for Godparents. The following are the diocesan guidelines. A godparent must be a baptised Catholic who is at least sixteen years old, has received the sacraments of Holy Eucharist and Confirmation, and is in good standing with the Catholic Church. Most parents choose their children’s godparents because of a personal relationship. But “godparent” is not merely an honorary title we bestow because someone is a friend or because it’s a certain relative’s “turn.” A godparent is supposed to be involved in the faith formation of the child as a Catholic. If you are new to our parish, we welcome you. We hope that you will feel part of the life of the parish. If you would like to register as a parishioner please contact the Parish Office. In the event of a Mass not being available for the anniversary of your loved one, a shared Mass with more than one intention will be celebrated in Castleisland Parish Church usually Tuesday and/or Friday evening. Mass for the recently deceased and for the sick will be celebrated on alternate Mondays. Those who died recently, that we have been asked to remember through the parish office. Those who are sick will not be mentioned but will be prayed for at the Mass for the sick. It gives people an opportunity to be present at the Mass where their intention is remembered. Offerings for these Masses are divided between the parish and Charities. Over the past year we were able to support some local charities as well as some people from the parish who worked in poorer countries. Three parishioners have been trained in the parish. Further details on the Parish and Diocesan policy in relation to safeguarding children can be found on the notice board of the Churches of the Parish. At least six months’ notice of the marriage should be given to the parish where the bride and groom live. A pre-nuptial enquiry form is completed by both the Bride and Groom. The State obliges you to give at least six months notice. For this purpose you may contact: Office of Registration of Births, Deaths & Marriages, Health Service Executive, Kerry Community Services, Rathass, Tralee, tel: 066) 7195632. Couples are requested to attend a Pre Marriage Course as part of the marriage preparation. In Tralee, pre-marriage courses may be arranged through ACCORD, at St. John’s Parish Centre, Tralee tel: (066) 7120194/7122280. Early booking is essential. Couples who may be considering doing courses other that ones organised by Accord are advised to speak to Fr Dan to ensure that the course meets the Church requirements.